Some people are capable of recognizing when someone is putting forth a lot of sincere effort, while others struggle to see this. For some the ability to accomplish something is all that really matters, and the effort can be a bit meaningless unless they see results. 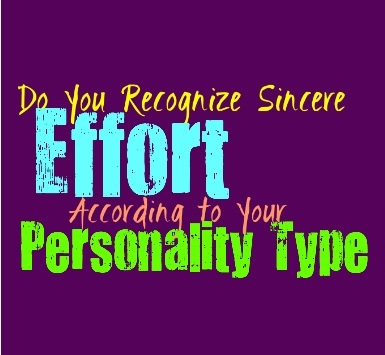 Here is how well you value and recognize sincere effort, based on your personality type. INFJs definitely recognize effort, sometimes a bit too much. Even when someone is failing they will notice that they are trying, and will give them credit for this. INFJs often believe in people even when they are struggling to believe in themselves. They don’t believe efficiency is more important than effort, and will certainly be able to recognize when someone is truly giving it their best. This can sometimes get the INFJ into trouble, since they see when someone is putting forth effort but might not notice how much they can be hurt by this person’s inability to live up to expectations. ENFJs are capable of recognizing effort, sometimes more than someone’s accomplishments. When someone is working hard to improve and be better than before, ENFJs often appreciate this. They care about people and are sensitive to their needs and emotions. When someone is truly trying and doing their best, they appreciate this even if that person is falling short. ENFJs can often see the good in people, even when they are struggling to see it in themselves. Because of this ability to see past the surface, they are definitely capable of noticing sincere effort. INFPs do recognize effort, especially if someone is expressing themselves clearly. They can often see the good in others and do their best to recognize when someone is trying but just falling short. They don’t need constant efficiency, and become annoyed with people who can’t see when someone is truly doing their best. INFPs are capable of forgiveness and understanding, especially with someone they believe in. Their ability to see the good in others often comes from their ability to recognize sincere effort in those around them. ENFPs are capable of recognizing effort, but at the same time they become fed up if someone keeps failing. They are more likely to recognize the effort in someone else, if that person also reciprocates this recognition. ENFPs definitely want people to see how hard they are trying, even if they are missing the mark sometimes. They do their best for their loved ones, and want those people to really see them for who they are. ENFPs also strive to believe in others and see the best in them, and so they are capable of seeing sincere effort. INTJs are capable of seeing effort, but they don’t value it as much as results. For them people who are missing the mark constantly, just need to dig deeper inside of themselves. INTJs believe that people need to work harder and find the strength to persist and get the job done. INTJs value efficiency and focus much more than someone who is just trying hard. INTJs often see that people are capable of more than they are accomplishing, and so they definitely have a hard time really valuing effort without results. ENTJs are more likely to recognize accomplishments over effort, since they realize that someone’s effort can only go so far. They believe that most people are capable of much more than they believe, and so for ENTJs most of the time falling short means being lazy. They can have a hard time recognizing when someone is trying, unless it is completely obvious and that person is actually showing improvement in their efforts. For the ENTJ results are much more important than someone’s effort and desire to get there, since for them actions speaker louder than words. INTPs can recognize and value effort, but most of the time they are so focused on their own business that it is hard for them to really notice things that seem insignificant. INTPs do value when someone is trying, they also understand that sometimes what people learn along the way is more valuable than results. For the INTP it is important to have room to grow and even make a few mistakes, so for them effort does matter. INTPs are observant people, but sometimes their desire to focus on logic and facts can make it hard to completely notice when someone is putting forth effort. ENTPs do recognize effort and they understand when people are simply following their own path. They don’t usually concern themselves with needing to constantly be efficient, as long as they are learning and growing along the way. ENTPs do value effort, and for them efficiency isn’t the most important thing. They often see when someone is trying, or in the very least doing something their own way, and they can respect that. ENTPs don’t need to follow the same path as everyone else, they enjoy doing their best to learn and grow. ISTJs are much more focused on efficiency than efforts, since they value people getting things done. For the ISTJ it can be frustrating to deal with people who try but can’t seem to accomplish their tasks. They value efficiency much more than they do effort, even though they do notice when someone is at least improving. They will help someone if they are willing to work harder, but ISTJs do value the results more than the attempts. ESTJs value efficiency much more than effort, so sometimes they struggle to really notice when someone has the best intentions. ESTJs work hard to get things done and if they are falling short they simply push themselves even harder. Since some people just have a hard time keeping up with the demands of the ESTJ, since they often have rather intense goals. They work hard to get things done, and value results much more than someone’s words. ISFJs definitely recognize effort, and to them this is truly important. While they believe in getting things done and working hard to be efficient, that doesn’t mean they don’t see when someone is trying their best. ISFJs care about people and can connect with their emotions, this helps them to notice when someone is sincerely trying their best. They recognize effort in orders, and can often see the good in people who are doing their best. ESFJs definitely recognize effort, sometimes more than results. They can see when someone is trying their best and they sincerely want to be there to help them improve. ESFJs care about others and are very empathetic to their efforts and their emotions. They want to take care of their loved ones and they understand that sometimes people all short even though they are trying their best. ESFJs value someone’s attempts just as much as their ability to achieve results. ISTPs do recognize effort, but most of the time they are more reactive to what they see. If someone is putting forth effort but falling short, they often see what is happening in the moment. Most of the time ISTPs don’t focus on what others are doing, since they don’t like judging someone for falling short. They pay attention to their own actions and focus on living their own lives. ISTPs don’t feel like people need to constantly be efficient, as long as they are living honestly. ESTPs do notice effort, but they are much more focused on what they see in the moment. If someone is continuing to fall short the ESTP might become frustrated, especially if it is holding them back in that situation. Most of the time they understand that people make mistakes and can struggle to be efficient, but for them it all depends on how much their actions affect others. ESTPs focus on the present, and often let go of the things that happened in the past. ISFPs do recognize effort, especially in someone they care for and believe in. They strive to live following their own hearts, instead of focusing on what others expect of them. ISFPs don’t mind making mistakes, they just want to feel free to do so without constant judgement. They realize that people will fall short, and they can appreciate when they are doing their best. They value someone’s sincerity and openness, much more than how efficient they can be. ESFPs definitely notice when someone is trying, and can sometimes believe their words more than they should. They care about their loved ones and often believe in the fact that they can do better. As long as someone is open about their feelings and how hard they are trying, the ESFP will do their best to stand by them and believe in them. Efficiency isn’t the most important thing for them, ESFPs care more about following their hearts.